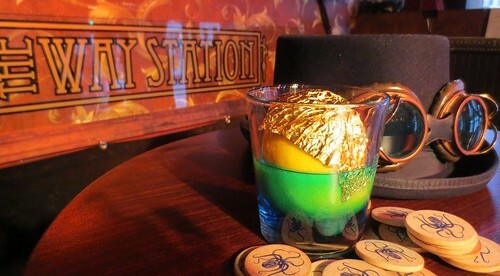 Whether you're already a regular at The Way Station, want to plan a pilgrimage there, or are interested in bringing your fandom into your life via interesting, clever, and delicious cocktails, I've got the book for you. 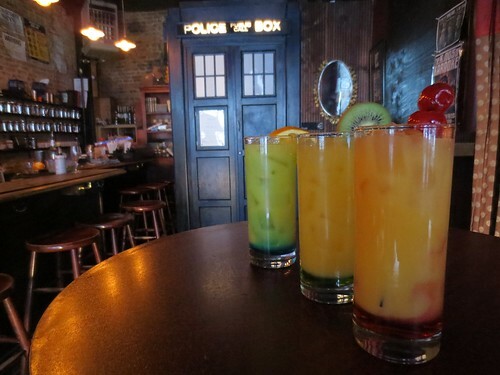 The Cocktail Guide to the Galaxy: A Universe of Unique Cocktails from the Celebrated Doctor Who Bar is a new book by Andy Heidel, the owner of The Way Station, a bar and music venue in Brooklyn, NY. 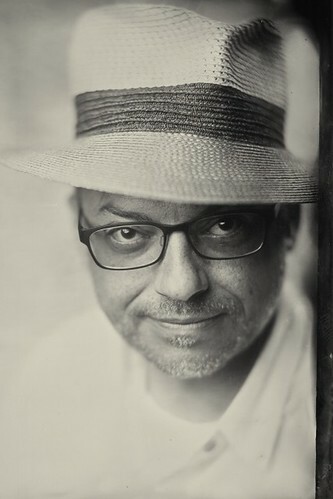 As R. Andrew Heidel, he is the author of the short story collection "Desperate Moon" which features an introduction by Harlan Ellison and praise from Ray Bradbury. As a book publicist, he launched the Eos imprint and helped make Neil Gaiman, Terry Pratchett, and Neal Stephenson bestselling authors, while with Avon Books and HarperCollins. He turned to bar ownership when he was downsized, and hasn't looked back since. What's your fandom? 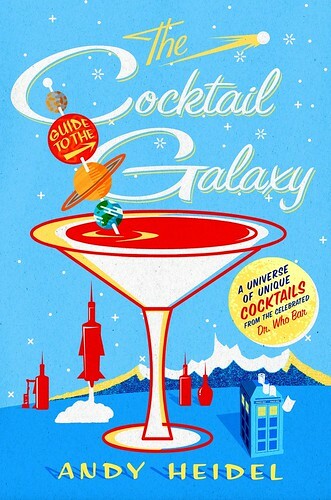 You'll mostly likely find it in The Cocktail Guide to the Galaxy. It's a fun read, one that will have you planning your own comic-con gatherings, or adding depth to your movie nights. The Cocktail guide includes over 100 cocktail recipes, as well as cocktail (and drinking) tips, interesting stories, and more. And, any book that starts with Ready Player One is already on my must-read list. Add in the many, many fandoms that Heidel shares cocktail recipes for, and you're one happy geek. Fandoms include (these are my favorites - I'm sure you'll find yours in this book, too): Back to the Future, Beetlejuice, Contact, Doctor Who, Fantastic Four, Firefly, Galaxy Quest, Game of Thrones, Ghostbusters, Guardians of the Galazy, Hitchhiker's Guide to the Galaxy, Indiana Jones, Men in Black, Star Wars, and Young Frankenstein. Besides the fandoms, you'll laugh at the cocktails' brilliant names, hilarious descriptions, and fun, perceptive illustrations. This is one book you'll want to read again and again, plan parties around, and include in your life. Highly recommended! The Cocktail Guide to the Galaxy is a compendium of nerdy cocktails inspired by the worlds of Science Fiction and Fantasy. After seeing cocktail books by other bars with overly complicated instructions, I wanted to write a book that had easy to make drinks that suited anyone's fandom, whether it be Star Trek or Star Wars, Dr Horrible's Sing Along Blog or Firefly. I absolutely love all the creative recipes. What is your research process? How did you narrow down the fandoms? The first part was cocktail name generation. Was there a cocktail that already existed that I could do a play on words with like the Sazerac which kind of sounds like Sarlacc (the desert monster that ate Boba Fett in Star Wars). So, I came up with the Sarlacczerac which is my spin on the classic cocktail. Narrowing down the fandoms was easy because they're all my favorite, some of which didn't make it into this book because of space issues. What might people be surprised to learn, about The Way Station? People will be surprised to learn that the replica of the TARDIS, the iconic blue police box from Doctor Who, was actually a Bob Ross happy accident. My good friend Doc suggested we build it to disguise the fact that our restroom was too close to the bar. Little did we know it would bring in fans from all over the world. What are your top suggestions for accompanying food, if someone were to throw a galaxy cocktail party? I'd keep it simple with finger foods, cheeses, bread, and giving them all different names. Instead of pigs in a blanket, call them "Cochon en duvet". Love the illustrations - can you please share more about the illustrators? The illustrators are all friends of mine. Ed and Liz I knew for years before opening The Way Station. Kati used to work for me and I hired her because she drew a TARDIS on her resume (not the only reason), and Teresa is a regular of the bar who usually sketches fantastical monsters. Each of them have unique styles which complement the cocktails they illustrated. I had no idea that when I set out to write a cocktail book that it would end up also being a humorous reflection on my drinking career. 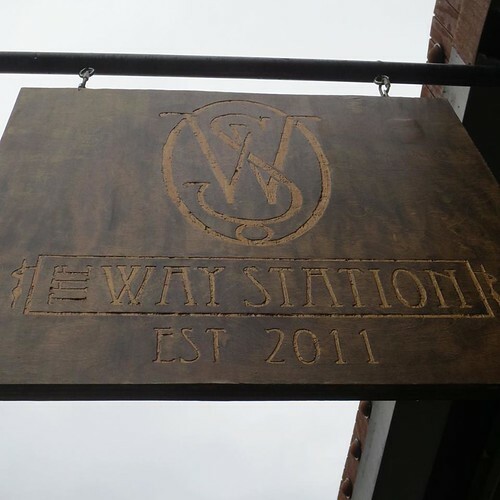 All photos courtesy and copyright Andy Heidel/The Way Station, except where noted.